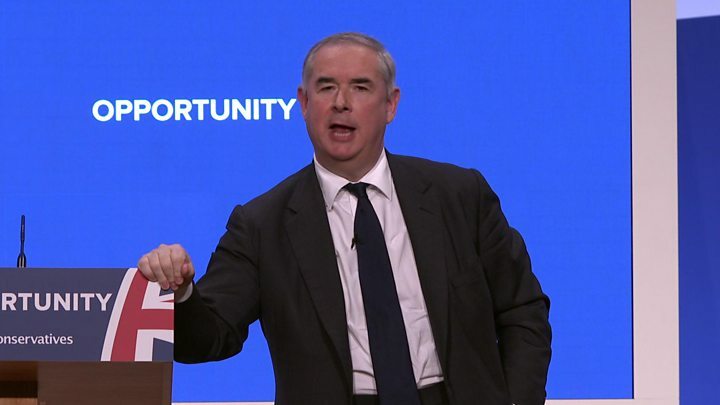 Attorney General Geoffrey Cox briefly stole the political limelight on Wednesday during his rousing warm-up act for the prime minister. Mr Cox, hitherto little known outside Conservative and legal circles, drew a new fan club on social media as his performance trended on Twitter. The MP for Torridge and West Devon, who is a QC, told activists the UK must seize the "precious prize" of Brexit. The PM was also impressed, remarking on the barrister's "wonderful voice". Mr Cox joined the cabinet as the government's senior legal officer in July, succeeding Jeremy Wright. At the time, it was reported that the prime minister wanted a sharp legal mind, as well as a Leave supporter, in the role to deal with the legal complexities of negotiating a Brexit withdrawal treaty. He used his oratorical skills, honed by many a courtroom battle over the past 30 years, to good effect as he urged the Conservatives to unite behind Theresa May and her task of taking the UK out of the EU. As well as clearly delighting Conservative supporters and amusing journalists, his stentorian performance sent tongues wagging about an unlikely leadership bid. But the praise was not universal for the MP who was, in 2016, criticised for submitting an expenses claim for a carton of milk despite being one of Parliament's highest earners. Mr Cox founded the Thomas More Chambers in 1992 and was appointed as a QC in 2003. He ceased private practice after becoming attorney general.